This policy details how Ryan asset Management ltd (the Firm) will manage data protection and data security and ensure a consistency of approach within the Firm and adherence to the Data Protection Regulation. The Firm recognises that failure to protect personal data poses a risk to employees and clients and to the reputation and good standing of the company, as well as risking financial penalties. Data Protection is regulated and enforced in the UK by the Information Commissioners Office (ICO) (https://ico.org.uk/). The Firm is authorised by the Financial Conduct Authority (FCA) and complying with some of the FCA rules requires the Firm to process personal data. While the ICO will regulate data protection, the FCA will also consider compliance with these regulations under their rules, in particular the Senior Management Arrangements, Systems and Controls standards in the FCA handbook (https://www.handbook.fca.org.uk/handbook). This policy will be reviewed by the Management Body and the data protection and compliance officer on an ongoing basis in line with any regulatory changes but at least once a year. The Management Body are responsible for the compliance with data protection and ensuring that the Firm is able to produce evidence to demonstrate the steps that it has taken to comply. The Data Protection Officer will take into account the risks associated with any data processing undertaken, having regard to the nature, scope, context and purposes of the processing. All employees, volunteers and business associates, such as Appointed Representatives, are required to read, understand and accept any policies and procedures that relate to the personal data they may handle in the course of their work. All employees who deal with personal information are required to handle that information confidentially and sensitively. Employees who undertake to process personal data supplied by the Firm must do so only in accordance with the Firm’s instructions. Employee obligations in respect of the Data Protection Act form part of their contract of employment. Personal data is any information relating to an, directly or indirectly, identified or identifiable natural person (also known as a data subject). Special category or sensitive personal data refers to data relating to racial or ethnic origins, political opinions, religious or philosophical beliefs, trade union membership, health, sexual life, sexual orientation, genetic data or biometric data. A controller determines when, why and how to process personal data. The Firm is the controller of all personal data relating to its employees, clients and others whose personal data is used in its business for its commercial purposes. A processor is responsible for processing personal data on behalf of a data controller and should act only on the controller’s instructions. Processing is any activity that involves the use of personal data such as obtaining, recording, holding, amending, using, transferring, erasing or disclosing it. The Firm is a processor of personal data. The Firm employs other firms to process some personal data. The data protection law states that the Firm shall be responsible for, and be able to demonstrate compliance with, these principles. The Firm will ensure that it has a lawful basis to process personal data. The Firm will ensure that the processing is necessary for its purpose and that there is no other reasonable way to achieve that purpose. The Firm will determine and document the lawful basis before beginning processing. There may be more than one lawful basis that applies to the processing and, if this is the case, the Firm will document it. The Firm will ensure that is can justify its reasoning for the lawful basis chosen. When choosing the lawful basis for processing, the Firm will consider what it is trying to achieve, can it reasonably be achieved in another way and whether or not it has a choice to process the data. The Firm has reviewed its lawful bases for processing in the light of the General Data Protection Regulations (GDPR) and updated them where necessary. These have been communicated to the data subjects before 25th May 2018. If there is a change in circumstances or a new purpose for processing the data then the Firm will review the lawful basis and make any changes ensuring that the data subjects are informed and the change documented. The Firm will record when, how and from whom it obtained consent and what they were told at the time of consent. The Firm has reviewed its existing consents in light of GDPR and obtained fresh consent where necessary. When using contract as the lawful basis for processing personal data, the Firm will ensure that the processing is necessary to deliver its side of the contract and that it could not reasonably do what was required without processing the personal data. When using legal obligation as the lawful basis for processing personal data, the Firm will ensure that the processing is necessary to comply with a law or statutory obligation and that it could not reasonably do what was required without processing the personal data. The Firm will identify the specific legal provision or appropriate source of advice that sets out its obligation. The Firm is unlikely to use vital interests as a lawful basis for processing personal data. When using vital interests as the lawful basis for processing personal data, the Firm will ensure that the processing is necessary to protect someone’s life and that it could not reasonably do what was required without processing the personal data. The Firm will not use vital interests as the lawful basis if the data subject is capable of giving their consent. The Firm will not use public task as a lawful basis for processing personal data. The Firm is aware that when it uses legitimate interests as the lawful basis for processing personal data that it takes on extra responsibility for protecting the people’s rights and interests. The Firm will avoid using legitimate interests as the lawful basis where individuals would not reasonably expect the processing or where their interests are likely to override the Firm’s legitimate interests. Purpose test – is the Firm pursuing a legitimate interest? Balancing test – do the individual’s interests override the legitimate interest? Considerations for these 3 tests are listed in Annex 1 – Legitimate Interests Assessments. If the LIA identifies significant risks then the Firm will consider performing a Data Protection Impact Assessment (DPIA) to assess the risks and potential mitigation in more detail. When the Firm uses legitimate interests as the lawful basis, the individual’s right to data portability does not apply. The Firm will record any special category conditions that are applicable to the personal data it is processing. Personal data on criminal convictions or offences can only be processed if the Firm has an official authority to do so or is processing the data in an official capacity. The Firm has no official authority to process criminal offence data. The Firm will provide this information to individuals at the time they collect the data from them. If the data is obtained from another source then the Firm will provide this information within a reasonable time and no later than a month after receiving the data. If the Firm is planning to communicate with the individual, it will provide the privacy information when it communicates for the first time. If the Firm is disclosing the information to a third party, the Firm will provide the individual with the privacy information at the latest when the data is disclosed. The Firm will regularly review and update its privacy information. Any new uses of personal data will be brought to the data subject’s attention before the new processing starts. The Firm recognises that individuals have the right to obtain: confirmation that their data is being processed, access to their personal data and the information provided in the privacy information. The Firm will provide this information free of charge. The Firm may charge a fee, based on the administrative costs of processing the request, for requests for further copies of the same information. The Firm will respond to any request for rectification of inaccurate or incomplete data within one month, or within three months if the request is complex. If the personal data has been disclosed to third parties, the Firm will inform them of the rectification. The Firm recognises that individuals have the right erasure in certain circumstances, and will erase the data without undue delay, contacting any third parties, to whom the data has been passed, to inform them to erase the data. When the processing has been restricted, the Firm will, except for the storage of the data, only process the data with the individual’s consent. The Firm will inform individuals before a restriction on processing is lifted. Where individuals have provided personal data to the Firm based on consent or for the performance of a contract and the processing is carried out by automated means, the individual has the right to data portability. The Firm will provide the personal data, without undue delay and within one month, in a structured, commonly used and machine readable form. The Firm will provide this information free of charge. The Firm recognises that individuals have the right to object to direct marketing (including profiling), processing for the purposes of scientific or historical research and statistics and processing based on legitimate interests or the performance of a task in the public interest or exercise of official authority. If an objection is received, the Firm will no longer process the personal data unless it can demonstrate compelling legitimate grounds for the processing which overrides the interests, rights and freedoms of the individual or the processing is for the exercise or defence of a legal claim. For direct marketing the Firm will stop the processing as soon as the objection is received. The Firm will inform individuals of their right to object at the point of first communication and in the privacy notice. The Firm does not carry out automated individual decision-making or profiling. Employees will be trained on their data protection and security responsibilities at induction and given the necessary ongoing training to perform their roles in line with the Firm’s policy and the data protection law. The Firm will use DPIAs to help it identify the most effective way to comply with its obligations and meet individuals’ expectations of privacy. The Firm will use DPIAs when using new technologies and when the processing is likely to result in a high risk to the rights and freedoms of individuals. The Firm will ensure that any personal data held will be processed in a manner that ensures its security. It will ensure that its systems and processes include protection against unauthorised or unlawful processing and against accidental loss, destruction or damage. The Firm has undertaken an assessment of its information risk to determine an appropriate level of security, reviewing the data held and how it is used as well as how the damage or distress it would cause if the data was compromised. The Firm will also ensure the resilience of its systems and services, to enable the systems to continue operating under adverse conditions and the ability to restore the systems to an effective state within a timely manner. The Firm will carry out periodic checks to ensure that its security measures remain appropriate and up to date. The Firm will only transfer personal data to third countries where the receiving organisations have provided adequate safeguards. Individuals’ rights must be enforceable. The Firm will cooperate with the ICO when requested. A personal data breach can be defined as a security incident that has affected the confidentiality, integrity or availability of personal data. If a security incident occurs, the Firm will establish whether a personal data breach has occurred and if so, establish the likelihood and severity of the resulting risk to people’s rights and freedoms. The Firm will investigate the cause of the breach and determine what steps are required to correct it and prevent a recurrence. Where a personal data breach occurs and it has been established that there is a likely risk to people’s rights and freedoms, the Firm will notify the ICO as soon as possible and within 72 hours of becoming aware of it. If the Firm takes longer than 72 hours to notify the ICO, it will provide the ICO with reasons for the delay. The information may be provided to the ICO in phases as soon as possible if it is not all available within 72 hours. In these cases the Firm will explain the delay to the ICO and advise when it expects to submit further information. A failure to notify the ICO can result in a significant fine. If a breach is likely to result in a high risk to the rights and freedoms of individuals, the Firm will inform those concerned as soon as possible. The Firm will record all personal data breaches, documenting the facts of the breach, its effects and any remedial action taken. Decisions whether to report the breach to the ICO, or inform individuals will also be recorded. Any breaches of the Data Protection and Security Policy will be recorded on the Firm’s breach log in conjunction with its Regulatory Breach Policy. Is there another less intrusive way to achieve the same result? Are you happy to explain it to them? What is the possible impact on the individual? Are any of the individuals vulnerable in any other way? The description must include “the nature, scope, context and purposes of the processing”. Which screening criteria you flagged as likely high risk. The Firm should consult with individuals unless there is a good reason not to. If it is decided not to consult then the decision and rationale must be documented. Data processors and all relevant internal stakeholders should also be consulted. Do your plans help to achieve your purpose? Is there any other reasonable way to achieve the same result? The Firm must include an assessment of the security risks, including sources of risk and the potential impact of each type of breach. To assess the level of risk, the Firm must consider both the likelihood and the severity of any impact on individuals. High risk could result from either a high probability of some harm, or a lower possibility of serious harm. The Firm should also consider its own corporate risks, such as the impact of regulatory action and reputational damage. Against each risk identified, the Firm must record the source of that risk and then options for reducing that risk. The Firm must record whether the measure would reduce or eliminate the risk. Take into account the costs and benefits of each measure when deciding whether or not they are appropriate. If a high risk is identified that cannot be mitigated, the Firm must consult the ICO before starting the processing. The ICO will give written advice within eight weeks, or 14 weeks in complex cases. If appropriate, the ICO may issue a formal warning not to process the data, or ban the processing altogether. As part of the sign-off process, the DPO should advise on whether the processing is compliant and can go ahead. If it is decided not to follow the DPO’s advice, the reasons for this should be recorded. Any reasons for going against the views of individuals or other consultees should be recorded. 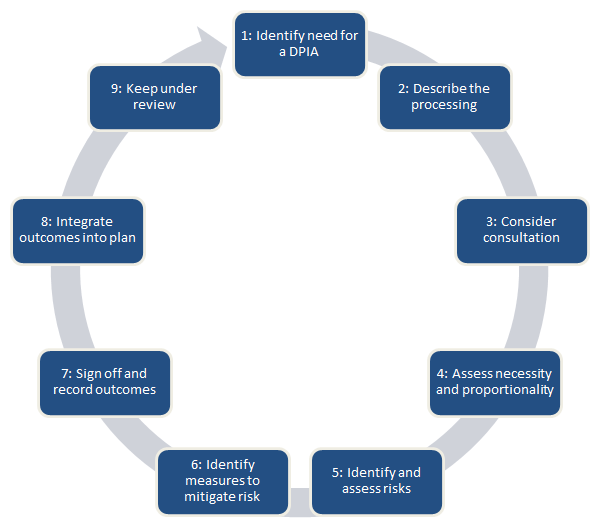 The outcomes of DPIAs must be integrated back into project plans, identifying any action points and owners. The Firm must monitor the ongoing performance of the DPIA.